For other uses, see Brumby (disambiguation). Today they live in many places, including some National Parks. These national parks include; Alpine National Park in Victoria, Barrington national park in NSW, Carnarvon National Park Queensland. Occasionally they are mustered and domesticated for use as campdrafters, working stock horses on farms or stations, but also as trail horses, show horses, Pony Club mounts and pleasure horses. They are the subject of some controversy – regarded as a pest and threat to native ecosystems by environmentalists and the government, but also valued by others as part of Australia's heritage, with supporters working to prevent inhumane treatment or extermination, and rehoming Brumbies who have been captured. An Aboriginal word baroomby meaning "wild" in the language of the Pitjara Indigenous Australians on the Warrego and Nogoa Rivers in southern Queensland. A letter in 1896 to the Sydney Morning Herald says that baroombie is the word for horse among the Aboriginal people of the Balonne, Nebine, Warrego and Bulloo Rivers. Baramba, which was the name of a creek and station in the Queensland district of Burnett, established in the 1840s and later abandoned, leaving many of the horses to escape into the wild. It has also been suggested that the name derives from the Irish word bromach or bromaigh. Horses first arrived in Australia in 1788 with the First Fleet. They were imported for farm and utility work; recreational riding and racing were not major activities. By 1800, only about 200 horses are thought to have reached Australia. Horse racing became popular around 1810, resulting in an influx of Thoroughbred imports, mostly from England. Roughly 3,500 horses were living in Australia by 1820, and this number had grown to 160,000 by 1850, largely due to natural increase. The long journey by sea from England, Europe, and Asia meant that only the strongest horses survived the trip, making for a particularly healthy and strong Australian stock, which aided in their ability to flourish. A Brumby that was caught in the Apsley River Gorge. Horses were likely confined primarily to the Sydney region until the early 19th century, when settlers first crossed the Blue Mountains and opened expansion inland. Horses were required for travel, and for cattle and sheep droving as the pastoral industry grew. The first report of an escaped horse is in 1804, and by the 1840s some horses had escaped from settled regions of Australia. It is likely that some escaped because fences were not properly installed, when fences existed at all, but it is believed that most Australian horses became feral because they were released into the wild and left to fend for themselves. This may have been the result of pastoralists abandoning their settlements, and thus their horses, due to the arid conditions and unfamiliar land that combined to make farming in Australia especially difficult. After World War I, the demand for horses by defence forces declined with the growth in mechanization, which led to a growth in the number of unwanted animals that were often set free. Throughout the 20th century, the replacement of horses with machines in farming led to further reductions in demand, and may have also contributed to increases in feral populations. Currently, Australia has at least 400,000 horses roaming the continent. It is also estimated that, during non-drought periods, the feral horse population increases at a rate of 20 percent per year. Drought conditions and brushfires are natural threats. Despite population numbers, feral horses are generally considered to be a moderate pest. Where they are allowed to damage vegetation and cause erosion, the impact on the environment can be detrimental, and for that reason can be considered a serious environmental threat. However, because they also have cultural and potential economic value, the management of Brumbies presents a complex issue. Brumbies roaming in the Australian Alps of south-eastern Australia are thought to be descendants of horses which were owned by the pastoralist and pioneer, Benjamin Boyd.. Feral horses in Barmah National Park mainly originate from stock released by a local horse breeder after 1952, there was no significant long term population of "wild" horses in the park area prior to this date. On the coast south of Geraldton, Western Australia the Brumbies there are known as ‘Pangare Ponies’, as they appear to carry the rare Pangaré gene. This colouring is commonly known as mealy and is seen mainly in a number of old breeds such as British Ponies, Timor Ponies, Haflingers and even Belgian Draught Horses. The gene causes lightening in parts of a horse’s coat, resulting in a mealy coloured muzzle, forearms, flanks, and the belly. It is sometimes seen in chestnut horses with flaxen coloured manes and tails. The Pangaré Brumbies appear to have adapted well to their coastal environment, where they are consuming saltbush, which they do not appear to be damaging. The Department of Environment and Conservation and the Outback Heritage Horse Association of Western Australia (OHHAWA) are monitoring these particular Brumbies to ensure the careful management of these unusual feral horses. This Brumby was used as a safe and reliable mount for a rider who was in her 70s. Captured Brumbies can be trained as stock horses and other saddle horses. Encouraging viewing of feral herds may also have potential as a tourist attraction. Brumbies are sometimes sold into the European horse meat market after their capture, and contribute millions of dollars to the Australian economy. Approximately 30% of horses for meat export originates from the feral population. The hides and hair of these horses are also used and sold. Wild Brumbies are used in Brumby training camps by organisations that promote positive interaction between troubled, high-risk youths. These camps usually last several weeks, allowing youths to train a wild Brumby to become a quiet, willing saddle horse while improving the youths’ self-esteem. Wild Brumbies are also used in the Brumby catch and handle event in stockman’s challenge competitions, where riders are required to catch a free running Brumby from their horse within a time limit of a few minutes. Sectional points are awarded for the stockman’s challenge for care and skill in catching the Brumby and their ability to teach them to lead. These demanding challenges for riders are held in New South Wales at Dalgety, Tamworth and Murrurundi plus The Man From Snowy River Challenge in Corryong, Victoria. Several New South Wales show societies, including Walcha, Bellingen and Dorrigo, hold special classes for registered Brumbies at their annual agricultural shows. Horses were first described as pests in Australia in the 1860s. Their environmental impact may include soil loss, compaction, and erosion; trampling of vegetation; reduction in the vastness of plants; increased tree deaths by chewing on bark; damage to bog habitats and waterholes; spreading of invasive weeds; and various detrimental effects on population of native species. In some cases, when feral horses are startled, they may damage infrastructure, including troughs, pipes, and fences. However, Brumbies are also credited for helping keep tracks and trails clear for bush walkers and service vehicles in some areas. Alpine areas, such as those of Kosciuszko National Park, are at particular risk; low-growing alpine flora is highly vulnerable to trampling, and the short summers mean little time for plants to grow and recover from damage. The biodiversity there is high, with 853 species of plant, 21 of which are found nowhere else. Erosion in the limestone karst areas leads to runoff and silting. Sphagnum moss is an important component of highland bogs, and is trampled by horses seeking water. Feral horses may also reduce the richness of plant species. Exposure of soil caused by trampling and vegetation removal via grazing, combined with increased nutrients being recycled by horse dung, favour weed species, which then invade the region and overtake native species, diminishing their diversity. The dispersal of weeds is aided by the attachment of seeds to the horses’ manes and tails, and are also transferred via horse dung after consumption of weeds in one location and excrement in another. Although the effects of the weeds that actually germinate after transfer via dung is debated, the fact that a large number of weed species are dispersed via this method is of concern to those interested in the survival of native plant species in Australia. The effect on plants and plant habitats are more pronounced during droughts, when horses travel greater distances to find food and water. They consume the already threatened and limited vegetation, and their negative influences are more widespread. Feral horses may also chew the bark of trees, which may leave some trees vulnerable to external threats. This has occurred during drought, among eucalyptus species on the Red Range plateau. It appears as though feral horses may prefer these species. In areas where horses are abundant, macropod populations are less prevalent. This is most likely due to the horses’ consumption of vegetation upon which the macropods normally feed. When horses are removed, signs of the presence of various macropods, specifically the black-footed rock wallaby, increase. Thus, competition with horses may be the reason for the decline in macropod populations in certain areas. Brumby populations also may have the potential to pass exotic diseases, such as equine influenza and African horse sickness to domestic horses. They also may carry tick fever, which can be passed to both horses and cattle. This can lead to high fatalities among domestic populations, causing many farmers to call for the management of feral horses. Like all livestock, Brumbies can carry the parasite Cryptosporidium parvum, which can result in serious gastroenteritis in people drinking contaminated drinking water. Although poor management of feral horses may pose an ecological and environmental threat in some parts of Australia, their management is made difficult by issues of feasibility and public concern. 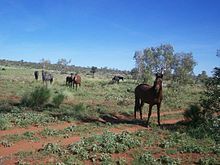 Currently, management attempts vary, as feral horses are considered pests in some states, such as South Australia, but not others, including Queensland. There is also controversy over removal of Brumbies from National Parks. The primary argument in favour of the removal of Brumbies is that they impact on fragile ecosystems and damage and destroy endangered native flora and fauna. Public concern is a major issue in control efforts  as many advocate for the protection of Brumbies, including the Aboriginal people, who believe feral horses belong to the country. Other horse interest groups resent the labelling of horses as “feral” and are completely opposed to any measures that threaten their survival. While some Animal welfare groups such as the RSPCA reluctantly accept culling, other organizations such as Save the Brumbies oppose lethal culling techniques and attempt to organise relocation of the animals instead. It has been argued that relocation, which often involves hours of helicopter mustering, would be more traumatic for the horses. Meanwhile, conservationist groups, such as the Australian Conservation Foundation, favour humane culling as a means of control because of the damage Brumby overpopulation can cause to native flora and fauna, but are also generally opposed to various means of extermination. This makes management a challenge for policymakers, though at present, the cost of allowing overpopulation of feral horses seems to outweigh other concerns. Brumbies awaiting their sale and new homes. The traditional method of removal, called Brumby running, is reminiscent of Banjo Paterson's iconic poem, The Man from Snowy River where expert riders rope the Brumbies and remove them to a new location. Options for population control include fertility control, ground and helicopter shooting, and mustering and trapping. None of the methods provide complete freedom from suffering for the horses, and the cost of each is very high. The costs include those that are economic, such as research, equipment purchases, and labour expenditures, as well as moral concerns over the welfare of the horses. As a result, more effective and efficient means of control have been called for. Fertility control is a non-lethal method of population management that is usually viewed as the most humane treatment, and its use is supported by the RSPCA. While it appears as though these treatments are effective in the breeding season immediately following injection, the lasting effects are debated. Because it is costly and difficult to treat animals repeatedly, this method, despite being ideal, is not widely implemented. Shooting by trained marksmen is considered to be the most practical method of control due to its effectiveness. The NSW Department of Primary Industries believe shooting is the preferred method of population control as it does not subject the horses to the stresses of mustering, yarding, and long-distance transportation, all of which are related to 'capture and removal' methods. Horses that are only initially wounded from shooting are tracked and dispatched if they are in accessible, open country. Brumbie advocacy groups do not consider mountain shooting to be humane. Helicopter shootings allow for aerial reconnaissance of a large area to target the densest populations, and shooters may get close enough to the target animals to ensure termination. This method is considered the most effective and cost efficient means of control, but disapproval is high amongst those that believe it is inhumane. Organizations supporting Brumbies argue that aerial shooting is unnecessary and that alternative population control methods have not been given adequate trials, while government officials express concern about the need to control rapidly growing populations in order to avoid ecological problems associated with too many feral horses in certain areas. Mustering is a labour-intensive process that results in one of two major outcomes: slaughter for sale, or relocation. It may be assisted by feed-luring in which bales of hay are strategically placed to attract feral horses to a location where capture is feasible. Complicating this process is low demand for the captured horses, making it less desirable than fertility control or shooting, which reduce the population without having to find alternative locations for them. Brumbies on the Chandler River, Oxley Wild Rivers National Park. Between 22 October and 24 October 2000, approximately 600 Brumbies were shot in the Guy Fawkes River National Park by the National Parks and Wildlife Service. As a result of the public outcry that followed the NSW Government established a steering committee to investigate alternative methods of control. Since the campaign began to remove horses from the national park, over 400 have been passively trapped and taken from the Park, and 200 of these have been re-homed. A particular breed of brumby, the Coffin Bay pony was completely removed from the Coffin Bay National Park and relocated to a neighbouring parcel of land by 2004. This was a result of a public outcry to a previously proprosed plan by South Australia's Department of Environment and Natural Resources to cull all animals in the park. A NSW National Parks and Wildlife Service cull during 2006 and 2007 in Kosciuszko National Park, where there were an estimated 1700 horses in 2005, resulted in a reduction of 64 horses. The NSW National Parks and Wildlife Service commenced a plan in 2007 to reduce Brumby numbers by passive trapping in the Oxley Wild Rivers National Park. Over 60 Brumbies captured in the Apsley River Gorge have now been re-homed. In 2008 the third phase of an aerial culling of Brumbies took place, by shooting 700 horses from a helicopter, in Carnarvon Gorge in Carnarvon National Park, Queensland. Brumbies, called "wild bush horses", are mentioned in Banjo Paterson's poem The Man from Snowy River. This poem was expanded into the films The Man from Snowy River and The Man from Snowy River II (US title: "Return to Snowy River" – UK title: "The Untamed") – also The Man from Snowy River (TV series) and The Man from Snowy River: Arena Spectacular. Another Banjo Paterson poem, called Brumby's Run, describes a mob of Brumbies running wild. Paterson was inspired to write the poem when he read of a N.S.W. Supreme Court Judge, who on hearing of Brumby horses, asked: "Who is Brumby, and where is his Run?" The popular Silver Brumby books by Elyne Mitchell were written for children and young adults. The stories describe the adventures of Thowra, a Brumby stallion. These stories were dramatised and made into a movie of the same name (also known as The Silver Stallion: King of the Wild Brumbies), starring Russell Crowe and Caroline Goodall. And also an animated children's television series. The Brumby was adopted as an emblem in 1996 by then newly formed ACT Brumbies, a rugby union team based in Canberra, Australia competing in what was then known as Super 12, now Super Rugby. Subaru sold a small coupe utility in Australia under the model name Brumby. It was known in other markets by various other names, including Shifter, 284, and BRAT. ^ Dobbie, W. R., Berman, D. M., & Braysher, M. L. (1993). Managing Vertebrate Pests: Feral horses. Canberra: Australia Government Publishing Service. ^ a b c d e f g Australia Government Department of the Environment and Heritage. (2004) Feral horse. (Equus caballus) and feral donkey. (Equus asinus): Invasive species fact sheet. Retrieved 2009-3-1. ^ Holland, Malcolm (15 March 2010). "Guns cocked as brumbies run wild". Herald Sun. Retrieved 20 December 2010. ^ Foster, Helen and Digby (2010). "The Guy Fawkes Heritage Horse Association Inc". Dorrigo, NSW: self. Retrieved 4 January 2010. ^ "Definition of "Brumby"". Compact Oxford English Dictionary. Oxford University Press. Retrieved 4 January 2010. ^ "WALGETT". The Maitland Mercury And Hunter River General Advertiser. XXVIII, (3651). New South Wales, Australia. 10 October 1871. p. 3 – via National Library of Australia. ^ "Definition of "Brumby"". Dictionary.com. Retrieved 3 January 2010. ^ a b Ludowyk, Frederick. "Wild Horses Running Wild". Retrieved 15 August 2011. ^ Berger, J. (1986) Wild horses of the Great Basin. Sydney: University of Chicago Press. ^ a b c d e f g h i Nimmo, Dale Graeme; Miller, Kelly K. (2007) Ecological and human dimensions of management of feral horses in Australia: A review. Wildlife Research, 34, 408–17. ^ Eberhardt, L. L.; Majorowicz, A. K.; Wilcox, J. A.(1982). "Apparent rates of increase for two feral horse herds." Journal of Wildlife Management, 46, 367–374. ^ a b Bomford, M., & Hart, Q. (2002). "Non-indigenous vertebrates in Australia." In Biological invasions: Economic and environmental costs of alien plant, animal, and microbe species. David Pimental (Ed.). Boca Raton: CRC Press. ^ Context Pty Ltd (2014). "History of Wild Horses in the Barmah National Park" (PDF). Retrieved 14 April 2019. ^ "NCHA: Stockman's Challenge" (PDF). Archived from the original (PDF) on 3 October 2009. Retrieved 16 December 2009. ^ "King of the Ranges Stockman's Challenge". King of the Ranges. Archived from the original on 11 September 2010. Retrieved 16 December 2010. ^ Pest Animal Control CRC. Feral horse. (Equus caballus) Retrieved 2011-11-06. ^ a b Dyring, J. (1990). The impact of feral horses. (Equus caballus) on sub-alpine and montane environments. Canberra: University of Canberra Press. ^ Beever, E. A., and Herrick, J. E. (2006) Effects of feral horses in Great Basin landscapes on soils and ants: direct and indirect mechanisms. Journal of Arid Environments, 66, 96–112. ^ Rogers, G. M. (1991) Kaimanawa feral horses and their environmental impacts. New Zealand Journal of Ecology, 15, 49–64, New Zealand Ecological Society, Inc.
^ Campbell, J. E.; Gibson, D. J. (2001). "The effect of seeds of exotic species transported via horse dung on vegetation along trail corridors". Plant Ecology. 157: 23–35. doi:10.1023/a:1013751615636. ^ a b Levin, P. S.; Ellis, J.; Petrik, R.; Hay, M. E. (2002). "Indirect effects of feral horses on estuarine communities". Conservation Biology. 16: 1364–1371. doi:10.1046/j.1523-1739.2002.01167.x. ^ Clemann, N. (2002). "A herpetofauna survey of the Victorian alpine region, with a review of threats to these species". Victorian Naturalist. 119: 48–58. ^ Chapple, R. (2005). "The politics of feral horse management in Guy Fawkes River National Park, NSW". Australian Zoologist. 33: 233–246. doi:10.7882/az.2005.020. ^ Shears, Richard (17 November 2007). "Mail Online News: Massacre at murder spring: The shocking cull of wild horses in the Aussie outback". Daily Mail. London. Retrieved 5 January 2010. ^ Senate Select Committee on Animal Welfare. (1991). Culling of large feral animals in the Northern Territory. Canberra: Senate Printing Unit. ^ "Feral Animals of the Northern Territory". Northern Territory Government. Archived from the original on 8 October 2009. Retrieved 20 December 2010. ^ Sharp, Trudy; Saunders, Glen. "Humane pest animal control" (PDF). Model code of practice for the humane control of feral horses. NSW Department of Primary Industries. Archived from the original (PDF) on 28 October 2009. Retrieved 19 December 2010. ^ "Cuddly Koalas, Beautiful Brumbies, Exotic Olives" (PDF). Archived from the original (PDF) on 2 April 2012. Retrieved 1 February 2019. ^ "Feral Horse Management Plan Draft – Oxley Wild Rivers National Park" (PDF). New South Wales National Parks and Wildlife Service. January 2006. Archived from the original (PDF) on 7 September 2006. Retrieved 4 November 2007. ^ Prentice, Jeff. "A Tribute: ELYNE MITCHELL, 1913–2002 MATRIARCH OF THE HIGH COUNTRY. Viewpoint: On Books for Young Adults Volume 10, Number 3, Spring 2002". Archived from the original on 30 October 2009. ^ "Official site of Brumbies Rugby". CA Brumbies. 2007. Retrieved 31 October 2007. Kosciuszko National Park Horse Management Plan (PDF). NSW National Parks and Wildlife Service, Department of Environment and Climate Change, NSW Government. December 2008. ISBN 978-1-74122-831-1. Retrieved 11 January 2010. Wikimedia Commons has media related to Brumby. Look up Brumby in Wiktionary, the free dictionary.